Have you ever seen planet Uranus? 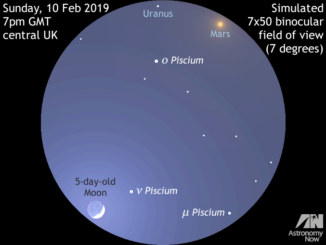 If skies are clear in the UK and Western Europe on the evening of Sunday, 10 February, see this icy gas giant less than 2 degrees (or four lunar diameters) from Mars and 6 degrees from the 5-day-old crescent Moon. In fact, you’ll see all three in a single view of wide-angle binoculars like 7×50s. Have you ever seen the International Space Station (ISS)? It’s capable of exceeding Venus at its brightest and visible for up to 7 minutes as it crawls across the sky in an arc from west to east. Find out when and where to see some favourable passes of this 450-tonne, 109-metre-long spacecraft over the British Isles and Western Europe this week. 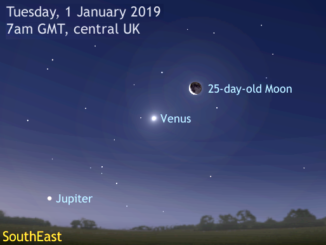 Skywatchers in the UK and Western Europe should look low to the south-southeast an hour before sunrise on 31 January to see a beautiful naked-eye conjunction of Venus, the old crescent Moon and Jupiter, all within a span of 8½ degrees. But if you have a telescope and live in just the right place, you can also see the Moon hide a double star. 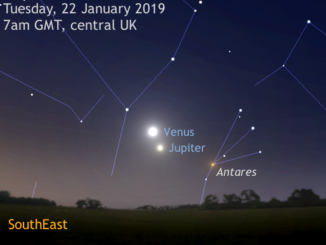 Observers in Western Europe with a clear view to the south-southeast at nautical dawn can watch the changing configuration two prominent naked-eye planets over the next few mornings, culminating in a beautiful close conjunction of Venus and Jupiter on 22 January 2019. 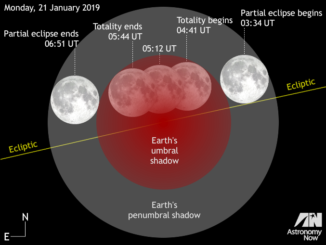 While you may not relish the prospect of waking up in the small hours most Monday mornings, observers in the British Isles and Western Europe will want to set their alarms no later than 5am GMT on 21 January to see this month’s showstopper celestial event — a total lunar eclipse of an unusually close ‘supermoon’. The total lunar eclipse is also visible in its entirety (weather permitting) from the Americas. 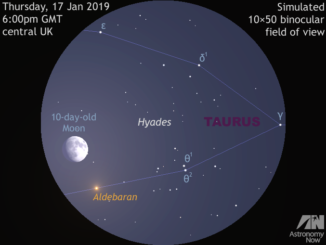 As dusk fades to dark on Thursday, 17 January, observers in the British Isles and Western Europe can see the rising 10-day-old Moon less than 1 degree away from first-magnitude star Aldebaran in the constellation of Taurus. Grab your binoculars to enjoy the sight of the gibbous Moon amid the Hyades open star cluster too. 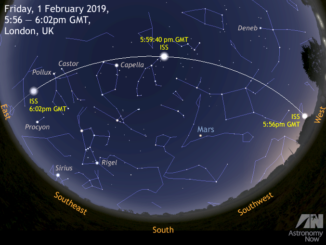 Observers should direct their gaze to the southern sky at dusk on Saturday, 12 January to view the 6-day-old waxing Moon in the constellation of Pisces. 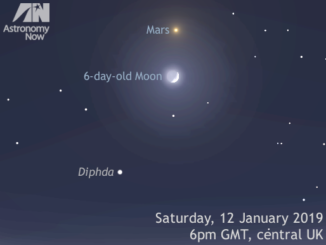 Look a little closer around 6pm GMT in the UK this night to see Mars as a magnitude +0.6 orange-coloured ‘star’ above the lunar crescent. If you own wide-angle 7× or 8× binoculars, you can see the Moon and Red Planet in the same field of view. 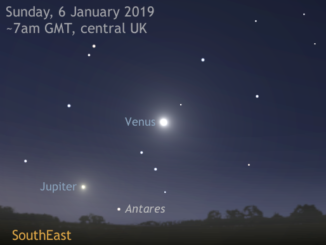 Brilliant planet Venus attains its greatest elongation almost 47° west of the Sun at dawn in the UK on Sunday, 6 January. Find a location that offers you a view down to the southeast horizon around 7am GMT and you may catch a glimpse of Jupiter too. The planetary duo is currently 14 degrees apart, but drawing nearer for a close conjunction on 22 January. 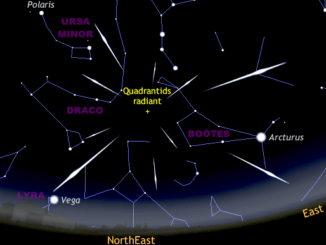 Hot on the heels of terrestrial fireworks ushering in the New Year, it’s time for some celestial pyrotechnics from the Quadrantid meteor shower – the year’s first major display of shooting stars – on 4 January. With an old waning crescent Moon not rising until nautical dawn in the UK, dark skies could see up to 80 meteors per hour around 2am GMT. 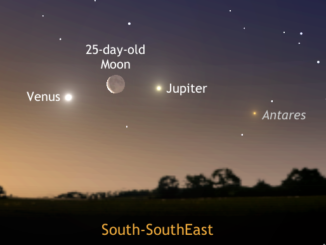 Early risers in the UK with an unobstructed horizon from southeast through south can see the old crescent Moon close to dazzling Venus in Libra then Jupiter in Ophiuchus over three consecutive mornings starting New Year’s Day around 7am GMT. The brightest and largest planets lie little more than the span of an outstretched hand at arm’s length apart at this time.